RUFUS is an automatically-guided, robot vehicle which serves as a pacesetter for human runners. It prevents runners from overpacing themselves by adjusting its velocity depending on the runners' heart rate. This chapter presents a set of techniques for reconstructing and understanding human motions measured using current motion capture technologies. We first review modeling and computation techniques for obtaining motion and force information from human motion data (Sect. 68.2). Here we show that kinematics and dynamics algorithms for articulated rigid bodies can be applied to human motion data processing, with help from models based on knowledge in anatomy and physiology. We then describe methods for analyzing human motions so that robots can segment and categorize different behaviors and use them as the basis for human motion understanding and communication (Sect. 68.3). These methods are based on statistical techniques widely used in linguistics. The two fields share the common goal of converting continuous and noisy signal to discrete symbols, and therefore it is natural to apply similar techniques. Finally, we introduce some application examples of human motion and models ranging from simulated human control to humanoid robot motion synthesis. This video shows an example of muscle tensions computed from motion-capture data. The muscle color changes from yellow to red as the tension increases. The blue lines represent tendons. Humanoid robots selectively immitate aspects of human form and behavior. Humanoids come in a variety of shapes and sizes, from complete human-size legged robots to isolated robotic heads with human-like sensing and expression. This chapter highlights significant humanoid platforms and achievements, and discusses some of the underlying goals behind this area of robotics. Humanoids tend to require the integration ofmany of the methods covered in detail within other chapters of this handbook, so this chapter focuses on distinctive aspects of humanoid robotics with liberal cross-referencing. This chapter examines what motivates researchers to pursue humanoid robotics, and provides a taste of the evolution of this field over time. It summarizes work on legged humanoid locomotion, whole-body activities, and approaches to human–robot communication. It concludes with a brief discussion of factors that may influence the future of humanoid robots. A method to plan optimal whole-body, dynamic motion in multicontact non-gaited transitions has been developed. Using a B-spline time parameterization for the active joints, we turn the motion-planning problem into a semi-infinite programming formulation which is solved by nonlinear optimization techniques. We address the problem of the balance within the optimization problem and demonstrate that generating whole-body multicontact dynamic motion for complex tasks is possible. This video shows basic function testing of the six-legged, underwater robot named Crabster developed by KRISO (Korea Research Institute of Ships and Ocean Engineering). 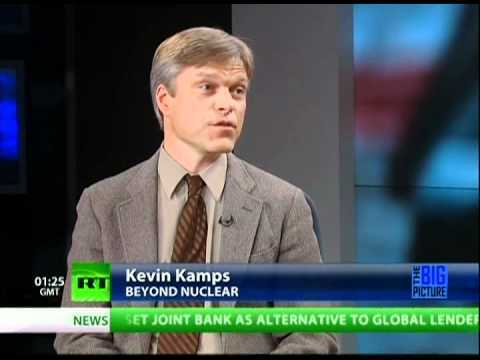 In this video from RT, the Russia-sponsored, English- language, news channel, Kevin Kamps from Beyond Nuclear claims that radiation levels at Fukushima are "too high" even for robots, which is only partly true. He goes on to claim that "countless thousands of emergency workers died from radiation exposure", claims which are contradicted by a large WHO study published in 2005. Unfortunately, there are many videos with doubtful claims, and one needs to be careful in searching for evidence. This video has been included in the collection to remind researchers to be cautious when evaluating evidence available from public-domain, video sources. Aerial robotic vehicles are becoming a core field in mobile robotics. This chapter considers some of the fundamental modelling and control architectures in the most common aerial robotic platforms; small-scale rotor vehicles such as the quadrotor, hexacopter, or helicopter, and fixed wing vehicles. In order to control such vehicles one must begin with a good but sufficiently simple dynamic model. Based on such models, physically motivated control architectures can be developed. Such algorithms require realisable target trajectories along with real-time estimates of the system state obtained from on-board sensor suite. This chapter provides a first introduction across all these subjects for the quadrotor and fixed wing aerial robotic vehicles. This video shows how paths are planned using software based on the Dubins airplane model. Author David J. Cappelleri et al. This video shows an example of peg-in-hole manipulation on the mesoscale. Three robust motion primitives are introduced, i.e., one-point sticking contact with counterclockwise rotation, two-point contact motion without rotation, and robust rotation. These motion primitives are sequentially executed to accomplish the peg-in-hole manipulation task. This chapter describes the emerging robotics application field of intelligent vehicles – motor vehicles that have autonomous functions and capabilities. The chapter is organized as follows. Section 62.1 provides a motivation for why the development of intelligent vehicles is important, a brief history of the field, and the potential benefits of the technology. Section 62.2 describes the technologies that enable intelligent vehicles to sense vehicle, environment, and driver state, work with digital maps and satellite navigation, and communicate with intelligent transportation infrastructure. Section 62.3 describes the challenges and solutions associated with road scene understanding – a key capability for all intelligent vehicles. Section 62.4 describes advanced driver assistance systems, which use the robotics and sensing technologies described earlier to create new safety and convenience systems for motor vehicles, such as collision avoidance, lane keeping, and parking assistance. Section 62.5 describes driver monitoring technologies that are being developed to mitigate driver fatigue, inattention, and impairment. Section 62.6 describes fully autonomous intelligent vehicles systems that have been developed and deployed. The chapter is concluded in Sect. 62.7 with a discussion of future prospects, while Sect. 62.8 provides references to further reading and additional resources. This video demonstrates robust lane tracking under variable conditions, e.g., rain and poor lighting. The system uses a particle-filter-based approach to achieve robustness. A micro-robot with remote magnetic propulsion for surgery inside an eye. This chapter introduces various construction automation concepts that have been developed over the past few decades and presents examples of construction robots that are in current use (as of 2006) and/or in various stages of research and development. Section 57.1 presents an overview of the construction industry, which includes descriptions of the industry, the types of construction, and the typical construction project. The industry overview also discusses the concept of automation versus robotics in construction and breaks down the concept of robotics in construction into several levels of autonomy as well as other categories. Section 57.2 discusses some of the offsite applications of robotics in construction (such as for prefabrication), while Sect. 57.3 discusses the use of robots that perform a single task at the construction site. Section 57.4 introduces the concept of an integrated robotized construction site in which multiple robots/machines collaborate to build an entire structure. Section 57.5 discusses unsolved technical problems in construction robotics, which include interoperability, connection systems, tolerances, and power and communications. Finally, Sect. 57.6 discusses future directions in construction robotics and Sect. 57.7 gives some conclusions and suggests resources for further reading. In the Obayashi ACBS (Automatic Constructions Building System) (Figure 57.29), once a story has been finished, the whole support structure, which rests on four columns, is pushed upwards by hydraulic presses to the next story over a 1.5 h period. Fully extended, the support structure is 25 m high; retracted it measures 4.5 m. Once everything has been moved up, work starts on the next story. By constructing the topmost story of the high-rise building as the roof at the beginning of the building process, the site is closed off in all directions, considerably reducing the effect of the weather and any damage it might cause.